"We hold tomorrow in our hands"
Did you know you can make a payment for your lunch account, student fees, athletic pass, etc right here on the website!! Select the "Make a payment" at the top of the page. A $5 transaction fee applies. If you send the money as “Money to friends and family” you are not charged any fees. PayPal address is jmaher@sidney.k12.ia.us . Make a note what the money is for. Any . 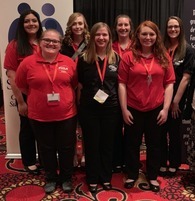 . .
Congratulations to Elise Chapman, Jordan Anderzhon, Dharma Bruce and Jaden Wallace for competing on the state level at FCCLA STAR Events. Elise has qualified to compete on the national level in July in California. For the 2019/2020 school year: Full-time 7-12 Spanish Teacher Full-time Life Skills Teacher (Strategist II endorsed) Full-time Elementary Teacher **Teachers willing to become endorsed in these areas are encouraged to apply. Current base salary of $41,100 If interested please send resume, transcripts and letters of reference to jmaher@sidney.k12.ia.us . Singin’ in the Rain - Cast and Crew 2019 Don Lockwood - Jaden Sears Lina Lamont - Jaden Wallace Roz - Haylee Sloop Cosmo Brown - Austin Graham Kathy Seldon - Jaden Daffer R.F. Simpson - Adam Thompson Dexter - Jackson Gorham Zelda - Sophie White Dora Bailey - Lily Matsuda Miss Dinsmore - Hannah Black Young Lady - Sharlease . . .
Tuesday March 26, 2019 Career Fair Day All of our 6th - 12th grade students had the opportunity to meet DeMoine Adams who was the keynote speaker to start the day. The students were then asked to break out into the first of three sessions. Each student was placed in 3 sessions which they had the option to choose from 17 different careers. Sidney Community Schools would like to thank the following . . . The students pictured attended Southwest Iowa Honor Choir at Iowa Western on January 24th. The students practiced all day with students from various schools across Southwest Iowa and then performed that evening in a concert. From left to right, front row: Sharlease Clark - Soprano, Jaden Daffer - Alto. From left to right, back row: Jaden Sears - Tenor, Jackson Gorham - Bass, Hannah Black - Soprano.